Someday I'll Sleep Autism Blogs: The "Extreme"
"Tell me your little girl is not dressed up as a nun. For Heaven's sake... Must everything be done to the very extreme?" I have a feeling this is a drive-by comment and that the writer will never see my response and yet I can't help but answer. After all I've met with this misconception before... and it couldn't be stomped out soon enough for my liking. Welcome to my blog. I can tell you're not a regular reader, because if you were, you'd probably remember that my two and a half year old began a campaign for a "Holy Baby" birthday party last spring, which developed into one request for a birthday present (that would be from the "Holy Baby" rosary DVDs... although you might think that's extreme too? DVDs about the rosary? The child should be watching Elmo! What are parents thinking these days?!?!). I know it may be hard for you to imagine, because it surprised me a bit, but there was only one thing that her little heart desired and she let us know loud and clear: A "Holy Baby" dress. She lobbied for it. She brought it up frequently. She begged and pleaded. I suggested Tangled and Dora. After all, Tangled and Dora would have been a lot less work. But she was adamant. And so, when it was clear that that was what she really wanted, and that it wasn't some passing phase, I got to work. I sewed and sewed. I found a few Nun accessories and took a print out of her favorite nun doll in to the bakery and explained that she'd been begging for a Holy Baby cake. The day rolled along, blazing hot like many June days in Northern California, but despite the heat she tore open the present and insisted on putting it on immediately, so she could wear it for her party. I guess my family might seem a little "extreme" to you, if you're disturbed by a photo of a child with her hand's folded in a nun's costume. Let's see... We do pray the rosary together every night. And we go to Mass on Sunday's. My children have probably been to confession (accompanying me or my husband) more times than many Catholic adults. We pray before meals. And they frequently tackle me when I'm praying the Divine Office. And you'd never guess what she's already asked for, for this year's birthday present: this snood. I asked her if she was sure. I suggested something in pink. She's brought it up for a couple of weeks though, a sure sign that she won't be changing her mind any time soon. And so daily I will be hearing: "Mommy, for my birthday... I want a black and white snood!" for the next five months. Today at Mass she grinned from ear to ear when she saw a nun come down from the choir loft to receive communion. While we read about the saint's and her little children's Bible, and pray together, I am still surprised when she tells me that she wants to be a nun. I'll admit that I've pointed out nuns when we see them, because of her love for her doll, but her fervent wish began and continues of her own accord. Just as her own sweet whispered prayers come from her own two lips, so this wish is her own. Who knows if it will last? I pray only that she finds the vocation that God is calling her towards. So that she may serve in whatever way that she will be called to serve. For now she seems to understand what she's supposed to be doing well enough. She loves God. She prays to him. She talks about Mary like she's a family member that comes by the house every day. She asks questions and absorbs the answers like a sponge. Maybe what our world needs is a little more of this type of joyous love. You call it "extreme," giving it a negative connotation. I think passion is a much better word for it. And I think that if we had more of this faith, like little children, and the love that pours forth from it, we might all be much, much better off. And maybe, just maybe, you should pause and wonder what it is about the sight of a cute, happy child with her hands folded in prayer, that brought about your reaction. I pray passionately that all my children will be given the same gift of faith that my oldest has.... and that we all may be granted it. I pray that it lasts a lifetime, even if that means that more than once they will be certainly called "extreme." After all, there is only one tragedy in this life... not to become a saint. And it seems to me that more often that not, the path to sainthood looks "extreme" to those looking on. So let us love God passionately, like little children and pray that we too can become like these little ones, who rejoice in their Savior and love him with their whole hearts. Bet you not one person comments when they see a young girl dressed as a Britney Spears type or when they see a little girl at a Lady Gaga concert. But they really let you have it, huh?!?!?! Wow, Cam. I can't keep up with your "fans." I guess on the bright side at least it means people are reading your blog and maybe, just maybe, some of them will leave a bit better than before they came. I'm a little frightened to know how Anonymous' daughters dress if she objects to a child's holy baby dress. Hang in there. At least if they come to make snide remarks, maybe they will have read something to light a spark later. Better that then that don't read at all. I think. My daughter just received a "prom" dress catalog in the the mail the other day. (She hadn't asked for it to be sent.) We were both pretty shocked at the "dresses" that are being marketed to teenagers, or women of any age for that matter, these days. Funny that our general culture seems to accept Barbies in suggestive cocktail dresses, and garments for high school dances that look like they ought not be viewed by the general public...but symbols of holiness and seeking after God, cause a stir. Stay on the path. You are a lovely mother with your heart and values in the right place. When watching TV, every now and then an ad comes on for that horrible little show (my bias is showing) Toddlers & Tiaras and every Sunday I see girls/women/teenagers arrive at mass in scandalous outfits. Maybe they don't know any better, but I can only imagine what all this does to the heart of our Blessed Mother. You and your little girls are a great consolation to me personally and I am sure to Her as well. I love what Melody said, "press on, faithful mama!" Most Catholic families do not have children dressing as nuns, or as Britney Spears, but rather as normal kids. Most Catholic mothers do not wear headcoverings, to Mass, or ever. Most Catholic husbands would be embarrassed to have their wife go out in public dressed in such outlandish accessories. Most Catholic children are not homeschooled. Most Catholic women wear a variety of clothing, including pants and shorts. Most Catholic mothers do not wish to turn their uteri into assembly lines. Moderation, my dear! Wow that was harsh... but I guess with anonymity you are safe to act harshly. I am a Catholic woman.. pretty average in fact. I choose to veil, my kids went to Catholic schools only because I had to work, rest assured they would have been home-schooled if I didn't have to work. My husband is proud to have a wife who veils... as for the assembly line... I wish I was so blessed. I am a Catholic mother. I homeschool my children and have since they were in utero. My daughter veils and wants to be a nun - she's 8. She asked for Altar Gang and Saint Stories CDs for Christmas. She voluntarily reads chapter books about Saints. She carries around an 18 inch doll of St. Therese. She wrote a letter to the editor (may I remind you, she's 8?) telling the story of Jesus' birth because she wanted people to know the truth about Christmas. My husband made a point to tell me how beautiful I looked one Sunday when I wore a scarf as a head-covering to church. While I realize that's not the point of covering one's head, it certainly indicates that he is not embarrassed to attend Mass with me. I currently wear a lot of pants, but that's because of my weight. One of my goals for weight loss is to be able to wear more feminine skirts and dresses. Lastly, both my husband and I would have been glad to welcome many more children into our family but unfortunately, I lost my uterus to disease. When I stood at that altar I promised to lovingly accept children as a gift from the Lord. I took that promise seriously and would have had as many as I possible could had that been physically possible. So please Anonymous, feel free to speak for yourself, but do not presume to speak for 'most' Catholic families. Cammie, you are a wonderful wife and mother, who is obedient to God and His will (judging from everything I have read). I hope you're laying all of this negativity at the foot of His cross and not allowing it to shadow anything you do for the good of God and your family. Most Catholic families are too lazy to take their children to Mass every Sunday. Most Catholic mothers seem to fail to understand the importance of what happens at Mass, i.e. the REAL presence of Christ. Most Catholic husbands would probably rather be watching football than at Mass. Most Catholic Children aren't being properly catechized, especially by their parents. Most Catholic families can barely manage to EAT together let alone pray before a meal. I'm quite sure that Cam is perfectly fine NOT being "Most Catholic Familes". And to be honest... so am I. But then again, I am a SAHM of 5 who homeschools, sings in the parish choir, veils at mass, and will be praying in front of Planned Parenthood tomorrow. And for the record, my husband thinks it's adorable that I veil, and loves it when I where skirts. He's also in charge of all the Catholic Schools in our diocese. Most Catholics aren't really Catholic. They are American. I think I'll stay Cam's kind of Catholic. Cammie, you are obviously doing it all right. You know it, your husband knows, your kids know it, and most of all, GOD knows it. Just because 'everyone else' is living a sinful life, and comes here and feels guilty when they see you doing good (then doesn't even have the guts to put their name to their posts), doesn't mean you should lower yourself to their level. High standards are there to be light to the world, and it's working--this person is obviously feeling some guilt for her choices. Apparently you're making her think about how she's living. So you go girl, keep being that light! I'll pray that your kids and mine find the vocation God has planned for them! We love you and are praying for you! Anonymous, why are you so hateful? oh and i LOVE the ruby slipper shoes with the habit... nice!!! I don't see how Sadie dressing up as Holy Baby is any more extreme than another child dressing up as her favorite character. Why does "Anonymous" care so much about what she's wearing anyway? Keep doing what you are doing. You're raising your girls right, don't let the negative comments of other people get to you. I have been around Sadie, a lot. She changes about once every hour. One minute she wears a sparkly green dress, then a pretty pink one, and so on and so on. She's a pretty typical toddler, enjoying wearing lovely dresses. Her favorite game to play with me is "twirling." I have also seen Sadie pray. It's beautiful. There are so many saints who made vows of chastity at very young ages, who desired God in a unique way from the moment they could lisp their first prayers at their mother's knees. Why isn't that beautiful to you? Or do you not believe these truths? If you don't, maybe that explains why the sight of a prayerful child seems to you to be "extreme." It's not extreme to love God and want to serve Him totally. It's not extreme for a child to be curious about being a nun, anymore than it is for a child to play "house" pretending to be a married woman with children. 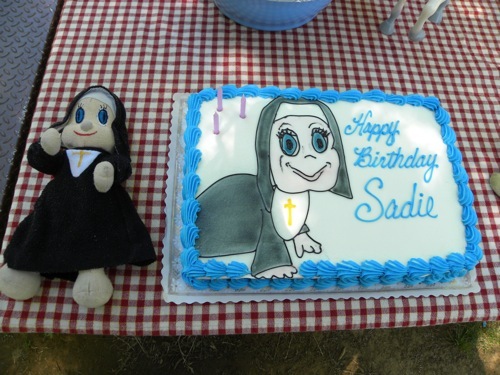 I suspect this comes from your thinking that nuns are holier than lay people, so Sadie dressing up that way means she's being "holier" than the girls who play house. Check your theology. Both states of life are holy. It's great that Sadie is exploring both in such a beautiful way. Maybe you should be open to being more extreme yourself. Anonymous... while one can't judge another's holiness by externals, your diatribe about "most Catholic mothers" led me to think about the narrow gate and the wide gate and where they each lead. Maybe we shouldn't be basing our judgments on what "most" people do if our goal is sainthood! The thing with posts from the Anonymous types (not sure if all of the ones posted are from the same person) is that there is something within Cam's convictions and the callings that her family has from God is striking a cord in him/her. I don't see any malice in the posts, but more of misunderstanding and the inability to comprehend such a calling. As my husband would call it, it's their own guilty conscience talking. For those who follow Cam's blog regularly, we all know that Cam openly shares her thoughts, feelings, and struggles with issues and situations that come into her life. We all know, though, that with that openness and boldness in sharing our faith, we will be persecuted and ridiculed for it. What remains then is how we choose to react to such an attack. We stand firm in our faith and allow the fruits of the Spirit to speak to their hearts. Definitely sounds like a drive by comment. Must of saw the picture and just assumed it was the parents idea. And if were the parent's idea I would be somewhat worried but not overly worried. Kids are dressed to look like hookers these days by their parents. That worries me more than a nun outfit. And how did this person not know it was a Halloween costume? For Pete's Sake I've seen adults wearing nun outfits for Halloween. What's the difference? Silly. Silly. If she/he read the blog, they'd realize that this is Sadie playing pretend dress-up. It's no different than if she decided to raid your closet or wanted to wear a princess outfit (which she does that too). Big deal. People read too much into things. And that's why I wouldn't have worried too much about it. It'd only bother me if I thought the parent was pushing it onto their kid (which clearly you and your family are not), but I would worry the same things about any outfit. Oh for pete's sake...I don't know why all the uproar about Sadie in a nun's costume. It's adorable! It doesn't mean that she's already made her mind up to be a nun. Maybe she will become one, or maybe she'll marry and give the nun's costume to her own little girl many years from now. You know, this poor anonymous person would have just died at me as a kid. I spent MONTHS wearing a string halter on my face and pretending to be a horse. Then there was the black leotard and tights and long tail and pointy ears during the "I'm a cat!" phase. I also spent months thinking how cool it would be to live in a burrow like a prairie dog. I had a very active imagination!! Later, I went through many clothing phases, such as ONLY jeans and t-shirts with ridiculous statements on them, like "Difficult but worth it!" and then there was the powder blue over-alls stage with the button on the back pocket that read, in Spanish, "kiss me I speak Spanish." Then there were the three years I spent with blue hair, and the pakastani clothing phase, and....well, I tried a lot of interesting styles along the way to how I dress today. There are also the people who love dressing up in clothing from other time periods and attend re-enactments of historical battles, or join organizations like Society for Creative Anachronism. It is very popular among some adults to attend science fiction and anime conventions dressed up as their favorite characters. For that matter, the last Renn-Faire I attended had several women wandering around in chain mail bikinis with nothing underneath. I wondered how they felt later when they had a dotted sunburn or how they could not be getting pinched by all those tiny metal rings. 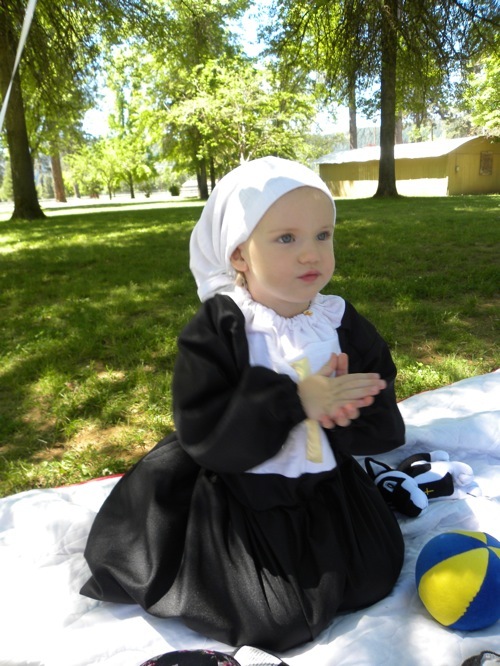 I see nothing wrong with a child who loves her Faith enjoying a "NUN" dress-up outfit. It is hardly any stranger than many other choices and a good deal more admirable than most. I will be honest, this makes me laugh! Does someone really think that it is extreme that you kids dress up as nuns?? I guess than, we are extreme because our boys dress as priests and play mass!?!? I think it is beautiful! Children love imaginative play, and who better to want to be like, than those who are holy! Sadie is living her faith at an early age, be thankful for that. Though I am not Catholic I am a Christian and like you; when the time comes and I am married I am open to as many children as God choose to bless me with. And as to her dressing up in her nun outfit nothing wrong with that. When I was her age and a little older I kept saying I wanted to grow up to be Amish. My great grandmother was a Mennonite and at young age I didn't know that there was a difference. Sadie and Mae remind me every time I read your blog that innocence still exist in the world. So thanks Cam for the reminder. Sadie is so sweet! She reminds me of me when I was a wee one, and I still "want to be a nun"!